Info "Best prison break ever." Bubble Break is a downloadable microgame in WarioWare: D.I.Y. and WarioWare: D.I.Y. Showcase. It was released on June 17, 2009 in Japan, May 17, 2010 in North America, and June 18, 2010 in Europe. 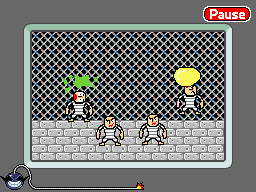 The game starts with four prisoners trying to break out of a prison by blowing bubbles made of bubble gum. The player must pop these bubbles before they reach the top of the screen. One prisoner has a yellow bubble which makes him travel faster. Once the bubble is popped, the prisoner falls and blows a new one. If the player has stopped all of the prisoners by the end of the time, the game will be won. If one escapes, the game will be lost. This page was last edited on October 9, 2018, at 00:00.